"Mallo Cups are my favorite! Thanks for great service and super fast shipping. The delivery was prompt and the goodies were delicious!" 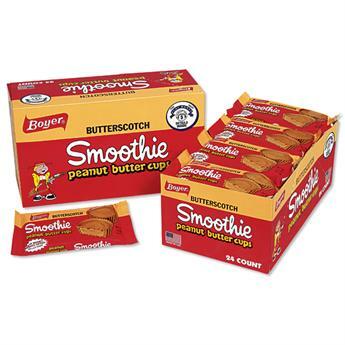 Home > View All Products > Smoothie Cups - 24 ct.
Smoothie Cups - 24 ct.
A butterscotch candy unlike any other butterscotch candy! This delicious candy is sure to satisfy your craving for something uniquely delicious and sinfully sweet. Smoothie cups feature a butterscotch coating over a crunchy peanut butter center. From the American made candy company that produced America’s first cup candy comes another delicious treat, the Smoothie Cup. These have been an all time favorite of mine since I was a small child. They are hard to find around here, but I finally found them at Ollie's and bought lots of them. My Mamaw always kept smoothies around and would split a pack with me, creating a love for this candy from an early age. Later, I would do the same with my best friend and now, all these years later, I split a pack with my Mom when we can find them! Smoothie cups are the best with their unique butterscotch/peanut butter combo! Stumbled across some yesterday and I bought 6! Now that I see they're for sale online, I'm never going to worry where I can find them again! Thanks for a great, delicious product! Got my coworkers hooked on them! So good, I had to order me a box. Now my coworkers are hooked on them. Ordering 2 boxes this time! I loved these things. Found some at Sheetz - turns out I still love 'em! ...Never got close to 500 points with the "5 Point Coin" in each pack. We realized at quite a young age that it took a lot of purchases to get 500 points! We even tried pooling our Play Money together. Nope! Not even close!